The idea of preferred names runs through the beating heart of Lady Bird. It comes to a head in a scene early on, as our protagonist and her best friend in the known world sign a sign-up sheet for an activity at their school. Christine – who would like to be called “Lady Bird,” thank you very much – places the given name (“It’s given to me by me,” she clarifies to the easily confused) between her birth name and surname in the same quotations I just used. Her friend does the same thing with a shorthand of her name (“Julie” from “Julianne”). It is not, Lady Bird (Saoirse Ronan) argues, the same thing at all. Julie (Beanie Feldstein), who later adopts another shorthand by which to be referred, disagrees. Both of these young women are finding themselves, and the concept of self-discovery is what drives writer/director Greta Gerwig’s exceptionally moving, exquisitely crafted study of the affairs of the heart. This is not, though, a simple, coming-of-age tale. There is no tidy resolution to a story in Gerwig’s screenplay. Likewise, there is no comfortable start. It begins in the middle of Lady Bird’s story, and it ends in the middle. That isn’t to suggest there isn’t movement within her character but that the movement is in the degrees relative to one’s teen age transitioning into adulthood. In other words, the character changes in ways that seem to her, at this transient period of her life, to be gigantic. In the long run, the changes are quite small, even as the snowball effect of those changes will lead to a path of escape from a life of drudgery and disappointment. One hopes that, given years of hindsight later in life, Lady Bird comes to realize this. Perhaps by the note-perfect final scene, she begins to grasp that truth. This, again, is not the kind of film in which any given character finds a convenient solution for their quirks or personal hang-ups. It is, though, a film that displays the range of compassion and human emotion. It finds comedy in the awkward and uncomfortable places of an older adolescent girl’s experiences. It locates the gravity of the drama when events within those experiences go awry. There is both a specificity and a broadness to the character that is genuinely inspiring. Film characters should not be so easily defined by how empowering, either specifically or broadly, they are. There is, though, a difficulty in seeing how young women everywhere won’t find this character empowering to some degree. There must, by the simple laws of likelihood in nature, be someone who finds something within themselves in Lady Bird. Her experiences are too universal not to be recognized in the experiences of the everyday, 17-year-old girl looking toward the future and seeing only uncertainty. As for the narrative, it’s mostly a patchwork of moments within Lady Bird’s final year at a Catholic high school. She’s looking at colleges that are both affordable and akin to the prestigious ones into which she doubts she can muster up the grades to gain entry. Her mother Marion (Laurie Metcalf) wants her to stay close, and her father Larry (Tracy Letts) just wants her to be happy. The dynamic here is complex and hardly easy to pin down. She is at constant loggerheads with her mother, whose nervous energy suggests a woman who easily shuts down in the face of tremendous strain, and though she enjoys a more emotionally open relationship with her father, it is disrupted by a revelation involving mental health that causes her to reevaluate almost everything. Letts and Metcalf are remarkable in roles that could have fallen into the archetypical traps of the “parent roles” but, thankfully, don’t. At school, she wants to fit in somewhere. That means a falling-out with Julie, who is “replaced” by cool-girl Jenna (Odeya Rush) when things fundamentally shift within Lady Bird, occurs even though everyone present knows that no one can replace your best friend in the world. She meets two guys and thinks it’s love both times when it’s really just a crush: Danny (Lucas Hedges in a terrific performance), a theater nerd ignoring a gigantic emotional truth about himself until he no longer can, and Kyle (Timothée Chalamet), an anarchist who seems to be floating through life. She attends school dances, makes plans that might not be ideal for those around her but that offer a chance at arriving at those greener grasses, and, ultimately, reclaims some lost bit of herself to which she never realized she had access. There’s even more here, every avenue explored thoroughly and satisfyingly within a compact, 93-minute frame. 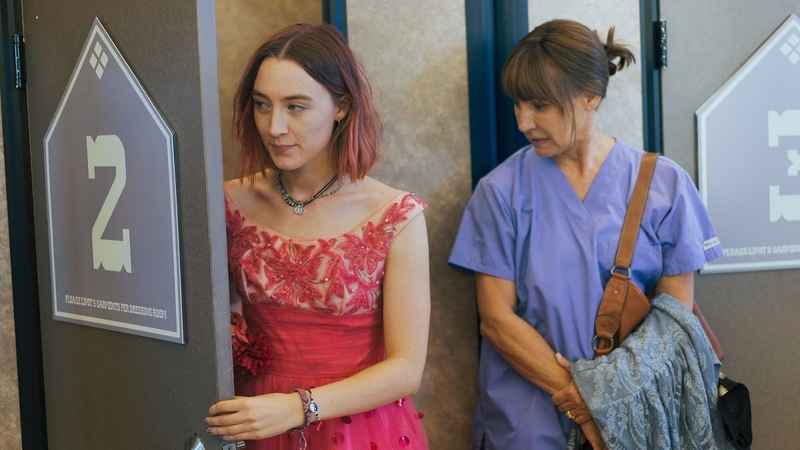 It isn’t too much weight for Gerwig to bear, and it certainly isn’t for Ronan, whose tremendous performance avoids making the quirks and tics within the character of Lady Bird some sort of joke. She’s unique – that’s for sure – but that uniqueness never becomes the defining characteristic of the performance. Like all of us, Lady Bird is discovering how she fits in while being her best self, and Lady Bird, a masterpiece about the baby steps that start this journey, understands that, sometimes, it takes a little work even to get to the baby steps.